Finally, we come to the element that most blatantly clashes with Tolkien's vision: the idea that you should ally with enemies for the greater good. While there are times in The Lord of the Rings where the heroes ally with "fallen" creatures like Gollum or the Dead Men of Dunharrow, the context for this differs from that in Shadow of Mordor. In Tolkien's works the heroes partner with possibly malevolent forces with the hope of redeeming them. Frodo feels pity for Gollum and a certain kinship since they've both carried the Ring's burden -- his hope to save Gollum mirrors the hope that he himself can be saved. Aragorn summons the dead to his aid with the promise that if they join him, their betrayal of Isildur will no longer curse them to remain in the world. True there are tangible benefits for the protagonists, but the offer also shows respect to the fallen by recognizing that they have the capacity for good. The alliances in Shadow of Mordor, by contrast, are realpolitik. They're practical and goal-oriented with no backing philosophy. 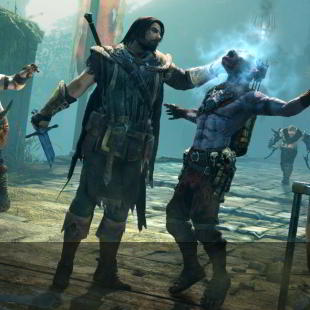 Talion dominates and turns Uruk captains and warchiefs because he needs them as leverage. He recruits Ratbag as a local ally not to give him a second chance, but because he's weak-willed, incompetent and easily manipulated. In this, he's like so many exiles and minor warlords the U.S. sponsored during its days in Afghanistan, doling out power and influence while communicating that the warlord would collapse without coalition support. There are also the more powerful and dubious allies like Queen Marwen and Celebrimbor, who may -- like Afghan president Hamid Karzai and Iraqi PM Nouri Al-Maliki -- advance their own agendas at their allies' expense. Partnering with entities that may be malicious is an ethical Rubicon Tolkien heroes don't cross, but Talion, written by those who've experienced decades of American interventions, looks on as practical and realistic. I'm not suggesting, of course, that Shadow of Mordor is an allegory for the last decade-plus of anti-terror operations. That would be facile and incorrect. Rather, I believe the current War on Terror has changed how we think about war and therefore how we conceptualize dismantling an enemy force. In Tolkien's books it happens through medieval means like building coalitions with feudal lords and rallying men-at-arms. Shadow of Mordor instead presents a counter-terror operation where the player conducts intelligence-gathering, assassinations, organizational disruption, recruits local leaders, fosters revolt and strikes training camps and other gatherings. It's interesting, but it's tonally jarring. There's nothing wrong with reinterpreting older stories through a modern lens. Indeed, it's unavoidable. The storyteller's own experience will inevitably alter their perception and cause them to choose themes in the work that conform to their understanding. It's no accident that after 9/11 historians started asking whether American Civil War figure John Brown was a terrorist, for instance, or that the Civil Rights movement spurred renewed focus on race in classic literature. History leaves fingerprints on our minds. It changes how we see the world. These reinterpretations can even help keep a work alive, making it resonate with an audience that might otherwise find it outdated. However, there's a difference between emphasizing one theme in a work and adding elements that aren't there. Shadow of Mordor does the latter. Bringing the modern understanding of war to Middle-earth contradicts Tolkien's most prominent themes: his suspicion of violence and power, hate for modern cynicism and belief that good should never engage with evil. Tolkien's heroes didn't thirst for revenge. They didn't use terror tactics against their enemies. They never dabbled in shades of grey or tried to use the enemies' weapons against them. Monolith crafted a fascinating mechanics system for Shadow of Mordor -- now it has to find a world that fits it. Robert Rath is a freelance writer, novelist, and researcher based in Hong Kong. His articles have appeared in The Escapist and Slate. You can follow his exploits at RobWritesPulp.com or on Twitter at @RobWritesPulp.